The content of this article provides interesting history, facts and information about Roman Helmets. The name for a Roman Helmet was a Galea. The mainstay of the Roman legion was on the infantry, which wore heavy armor consisting of helmet, breastplate, greaves on the right leg, and on the left arm a buckler. The helmet was originally made of leather or untanned skin, strengthened and adorned by bronze or gold. Leather helmets were made by the process of tanning which consisted of the conversion of hides into leather by steeping them in a solution of tannin, an acid solution often brewed out of oak bark or gall. Later Roman Helmets were beaten out of a single sheet of iron or brass affording greater protection for the soldiers. Helmets were often crowned with a knob or spike designed for the attachment of crests as well as frequently having tubes attached at the side of the bowl of the helmet for feathers. 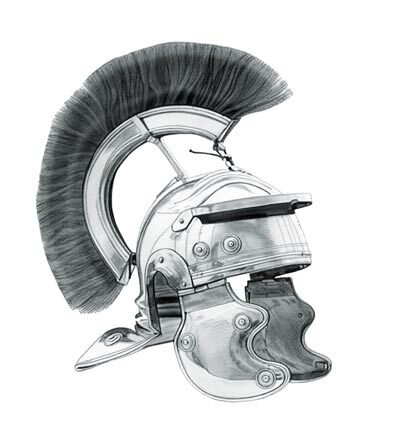 The Roman helmets of the commanders were surmounted by a crest which was often made of horse-hair or feathers, and so made as to give an imposing look with the illusion of height that helped him to appear more commanding. The crests were attached to the Roman helmets by a central support called a crest block or plume holder. Later Roman helmets were deigned with an iron band running the whole length of the helmet from front to back with a gap to insert the crest. Italic and Gallic forms of helmets had fittings to enable the attachment of decorative crests, by differing means, either slot or twist. The crests served not only for ornament, but to distinguish the different centurions. The centurions wore a transverse crest, meaning that it ran from side to side across his helmet. It is believed that centurions wore these crests in battle during the early Empire as the crests served as a visual reference and rallying point for their men. Lower ranking soldiers only wore the crests for special occasions such as parades or triumphs. The colors used for crests of Roman helmets are believed to include red, purple, black, white and yellow, although in art they always appear to be depicted as red. Montefortino Helmets were the earliest syles of Roman helmets and worn by the soldiers in the armies of the Republic from the 4th century BC to the 1st century BC. They were derived from a Celtic helmet design and were originally made in Montefortino. These helmets were conical in shape and made from brass. The Montefortino helmets had a small extension at the back as a neck guard. They normally have a plug-in plume holder on the crown of the helmet. Coolus Helmets were worn 3rd century BC - 1st century AD. They were based on a Gallic form of helmet made in the Coolus district of Marne. The Coolus pattern helmet was made in bronze or copper alloy. The bowl of the Coolus Roman helmet had a rounded shape with a pronounced projecting neck guard and a large angular cheek piece. Most had a simple spike as a plug-in plume or crest holder. Imperial Gallic Helmets were worn from the late 1st century BC - early 2nd century and based on the type of helmet used by the Gauls. These were more decorated than earlier helmets with embossed “eyebrows”. Imperial Gallic Helmets more closely follow the shape of the wearers head with ear cut outs. Ear protectors are provided and separately attached. They had a re-enforced peak, cheek pieces and a ridged extension at the back as a neck-guard. Mainly made of iron and with with brass decorations. Substantial "hot cross bun" style cross bars were added to these helmets providing additional protection. Imperial Italic Helmets were worn late 1st BC - early 3rd century and similar in style to the Gallic helmets. a sloped neck guard with ribbing at the nape, projecting ear guards, brass trim, and decorative bosses. The content of this Roman Helmets category provides free educational details, facts and information for reference and research for schools, colleges and homework. Refer to the Colosseum Sitemap for a comprehensive search on interesting different categories containing the history, facts and information about Ancient Rome.